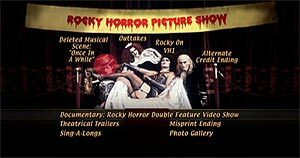 The The Rocky Horror Picture Show - The 25th Anniversary Edition DVD was released in the UK on Monday 12th February, 2001 as a fantastic two disc set. A VHS video with value added extras was also be released at the same time. The DVD and the VHS video are rated as a "15" certificate for the UK. The packaging is beautifully designed with each disc featuring a picture that fits into the case to make up a complete floorshow image and includes a booklet listing individual scene selections as well as an audience participation prop list and biographies of the cast. The booklet also features some of the rarer Rocky Horror Picture Show photographs taken by Mick Rock during filming. This has got to be one of the best packaged DVD's released so far in the UK. It is certainly the best version of the Rocky Horror Picture Show to be released, and for a movie that we all like to watch over and over again, it's very well suited to DVD video. Patricia Quinn (The Original Magenta) took part in a signing of the Rocky Horror Picture Show Region 2 DVD and the re-release of the VHS video at Tower Records, Piccadilly Circus, London on Monday 12th Febraury, 2001. The signing was very well attended by both fans and the Press. Stephanie, Davy and a group of TimeWarp members were in costume at the signing to help with the event and spent a great couple of hours handing out flyers and posing in the window of Tower Records. Click here for some images from the day. Disc One features a widescreen UK print of the movie, which includes the full version of the song 'Superheroes'. 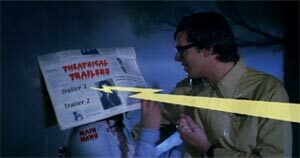 There is also a 'hidden' version of the movie, which starts in black and white as in the original shooting script for RHPS. The disc also features a commentary by the stars of the movie; Richard O'Brien (Author and 'Riff Raff') and Patricia Quinn (Magenta), which gives a great insight into the making of our favourite film. A 'Participation Prompter' gives you on-screen prompts to throw your rice and wear your newspapers (mind the DVD player with the water-pistols though!). There is also the option to view the movie complete with 'The Theatrical Experience'. This gives the viewer cut aways to an actual film showing, complete with full audience participation. Disc Two is absolutely packed with bonus material. There is footage from the song 'Once in a While' which was cut from the movie version, although of course it still features in all stage productions. Disc two also includes forty five minutes of excerpts and outtakes from the VH1 shows 'Behind the Music' and 'Where are they now? ', with interviews featuring Richard O'Brien, Patricia Quinn, Susan Sarandon (Janet), Barry Bostwick (Brad) and Meatloaf (Eddie). 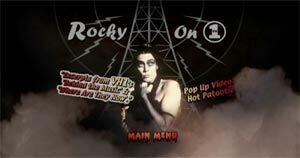 The Rocky Horror Double Feature Video Show documentary lasts thirty seven minutes and gives an interesting insight into the fan culture in the USA, where Audience Participation first started. To round the second disc off, there are eleven minutes of Outtakes from the filming, along with alternate Credits Ending, the Misprint Ending, a Photo Gallery and original Trailers for the movie. The VHS Video released at the same time as the DVD contains a a collection of value added extras which includes 'Once in a While', the eleven minutes of Outtakes and the thirty seven minute Rocky Horror Double Feature Video Show documentary. The video is presented in a pan and scan (full screen) format. CELEBRATE 25 YEARS OF ABSOLUTE PLEASURE! With a jump to the left…...and a step to the right..…the excitement begins! 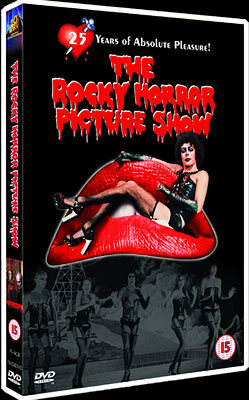 Celebrate 25 years of absolute pleasure with the DVD and video release of The Rocky Horror Picture Show. Released to buy from Twentieth Century Fox Home Entertainment on 12th February, this delightfully decadent, madcap story is the ultimate all-time cult favourite. Available for the first time ever on DVD and as an extras-packed VHS, both formats will seduce you with added value special features. Lavishly packaged in a glossy boxset, the DVD contains two fantastic discs that include a commentary by director Jim Sharman, audience participation and theatre experience tracks, deleted scenes, outtakes and more. Starring the gender-bending Tim Curry (Dr. Frank-N-Furter), Susan Sarandon (Janet Weiss), Barry Bostwick (Brad Majors), and Meatloaf (Eddie), your home can now become a theatre of super-charged sensuality and outrageous fantasy! Having maintained its position as a midnight movie favourite, the Rocky Horror Picture Show is hugely popular with both 'virgins' and 'experienced' audiences alike. After Janet Weiss accepts Brad Major's marriage proposal, the happy young couple stumble across a castle, owned by Dr. Frank-N-Furter, a transvestite scientist from outer space. Heading the annual convention of visitors from the planet Transsexual, Frank-N-Furter unveils his new creation, a young man named Rocky Horror who fears the doctor and rejects his sexual advances. The repressed Brad and Janet spend an unforgettable night at the castle, desperately trying to survive the diabolical charms of Dr. Furter who changes their lives and libidos forever. This Press Release and the Product Details page are also available here as a Microsoft WordTM Document. Go to the main menu, then select the audio you want, if required. Next go to the scene selection but don't choose a scene, instead click to the left of the screen and a pair of Lips will appear. Click on the Lips to see the original idea for Rocky with the start of the movie in Black and White (On some dvd players you may need to press the display button on the remote control when the movie starts and select to play track 2, thanks to James for that tip). TimeWarp got together with 20th Century Fox Home Entertainment to give two lucky people the chance to win a copy of the Rocky Horror Picture Show on DVD. During February 2001 our monthly competition featured the DVD as a bonus prize. The lucky winners were Fran Wray from London and Sara Aspinall-Harrison from Selby. All DVD/Video images ©1975 Twentieth Century Fox Film Corporation. All Rights Reserved. © 2001 Twentieth Century Fox Home Entertainment, Inc. All Rights Reserved. This page and information © TimeWarp 2001.